Be the first to share your favorite memory, photo or story of Don. This memorial page is dedicated for family, friends and future generations to celebrate the life of their loved one. Bro. Don Cummins, 84 of Mt. Vernon, passed from this life and his faith became sight on Wednesday, March 13, 2019 at his daughter’s home in McKinney after a short battle with cancer. 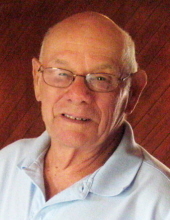 He was born on December 22, 1934 to the late Rayme and Hazel Cummins. A graduate of Brodhead High School, he later received the call to preach and graduated from Clear Creek Baptist Bible College and went on to pastor several churches in the area. He proudly served his country in the Army’s 9th Medical Battalion and was a member of First Baptist Church of Mt. Vernon. He was also Past Master of Brodhead Masonic Lodge, and for several years, farmed and worked as a tool-and-dye maker. He is survived by his three daughters, Vicki and Randy VanHook and Sherri and David Spears, both of Somerset, and Nina and Shawn Hines of McKinney; one daughter-in-law, Jamie Cummins of Richmond; seven grandchildren, Rodney Todd, Jon Spears, Brandi Super, Evan Cummins, Rachel Wilson, Autumn Hines, and Seth Hines; seven great grandchildren, Rami Todd, Cooper Spears, Sophie Cummins, and Micah, Abel, Lily, and Ezra Super; a sister, Nancy Meadows of Mt. Vernon; and a sister-in-law, Norma Cummins of Mt. Vernon. In addition to his parents, he was preceded in death by a son whom he grieved dearly, Donald Gene Cummins; a brother, Earl Cummins; a sister, Reda Connor; and a very special grandma, Bessie “Ma” Cummins. Donations are suggested to the Woodstock Community Center (1321 S. Hwy 39, Somerset, KY 42503), where he loved to spend time or to Heritage Hospice (PO Box 1213, Danville, KY 40433) who provided him comfort during his final days. To plant a tree in memory of Don Cummins, please visit our Tribute Store. "Email Address" would like to share the life celebration of Don Cummins. Click on the "link" to go to share a favorite memory or leave a condolence message for the family.